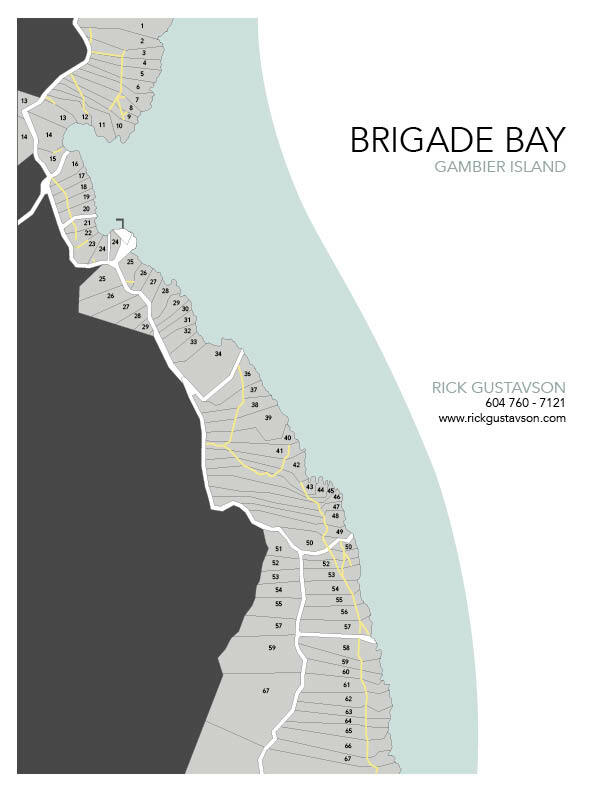 Brigade Bay – Gambier island from Rick Gustavson on Vimeo. Brigade Bay lot 68 Gambier Island is a true trophy property with 12.7 acres of treed land surrounded on 2 sides by parkland, ocean on the 3rd and your neighbour on the 4th, privacy is assured. Approximately 220 feet of easy accessible waterfront but if that is not enough there is an easement on the neighbouring lot granting a second level access to the waterfront. Slip your kayak into the water or go for a swim from your property. Two fabulous private and easy to develop waterfront building sites. The property has its own drilled well and the septic system has been designed and approved and the field installed. Great sun. Brigade Bay has its own year-round marina for the exclusive use by the 68 property owners. Over half of the Brigade Bay properties have been developed ,this is a vibrant, and fun group who are always ready to help a new “Brigader”. Fantastic views of the North Shore mountains, zoning permits two dwellings, there is no requirement to build. Fifteen minutes by boat from Lions Bay West Vancouver, under 1 hour from Downtown Vancouver. This legacy property is awaiting your dream cabin. Brigade Bay Gambier Island, Lot #15, 2.25 acres of completely useable lush green vegetation with 95′ of walk out level beach frontage. Picture perfect protected bay ideal for children to spend hours hunting for crabs, swimming, and building rafts while you quietly enjoy reading that book. Gently sloping toward the beach with numerous easy to develope building sites. Zoning permits 2 dwellings there is an existing drilled well. Huge views of the Bay & North Shore Mountains. A very bright lot with sun all day. Brigade Bay owners enjoy access to a private year round marina. 45 minutes from downtown Vancouver. All properties have proven septic fields.